Today we welcome St. Francis Xavier, SJ (+1552) who speaks to us from a letter he wrote to his superior, friend, mentor and fellow Basque, St. Ignatius of Loyola, founder of the Jesuits. On his feast day, we St. Francis’ feelings on finding a group of unformed Christians in India. I think this is relevant to our situation today, and I expand on that. Also, we have another installment of stories about the fictional don Camillo Tarocci, (+ A.D. … ?) parish priest of “The Little World”. This entry was posted in don Camillo, PODCAzT, SESSIUNCULA and tagged digital continent, don Camillo, podcast, PODCAzT, St. Francis Xavier. Bookmark the permalink. Thanks for the PODCAzT Father! It’s interesting to hear of St. Francis’ experiences in Asia and contrast them to my own. It’s very odd being in a country where God isn’t part of the culture. 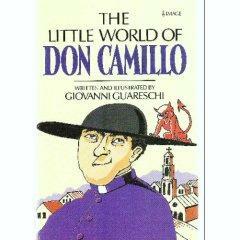 I always appreciate the installments of Don Camillo! Thank you, Fr. Z. I look forward to listening to this, probably over the weekend. I was listening to it directly from the web page and it cut out at about 13:58 or so. Bill: Really? It downloaded and played for me. Is this the Bill Haley from The Falls Church by chance? I love your PODCAZTs, Fr. Z! I also like the old-time ‘radio serial music’ you used at the beginning and the end of the Don Camillo readings. Were these stories ever put on radio, by any chance? This is the first time I ever heard these stories!